I loved the other overalls that I made my little guy so much that I decided to make up another pair. This time I used some awesome linen from Gray Line Linen in the Garment District. As I mentioned before they are kinda my favorite store right now. I love the natural feel of linen and the fact that I can kinda get away with letting them be wrinkled. This really might be one of my favorite things that I’ve ever made for my kids. I love that it’s classic and yet still modern. I’m not one to hang onto my kids clothes once they grow out of them, but this one just might make it to the “for the grandkids one day” pile. The pattern is vintage Simplicity 6948 from 1975. It’s a simple and very classic overall pattern with a cool overlapping feature to the straps that makes it a little tricky to make, but looks really cool once it’s done. The only bummer for me is that the pattern is only in a size 1 which means that I probably won’t be able to make anymore for my little boy although I do think that this would be a great baby shower boy gift so I will probably keep it around. I didn’t make any changes to the pattern except that I used a contrasting mustard fabric for the lining. One of those happy accidents because I ran out of fabric. If you want to check out my other version of these overalls you can see them here. wow they’re so cute! you found the perfect fabric for this pattern! love the contrasting lining! love it! thanks so much. the lining was not on purpose, but im so glad that it turned out that way. Super cute, and very very well executed! I don’t blame you for wanting out hang onto them! thanks! i do wish that i had matched the stripes better, but all in all im pretty excited about them. He is so adorable Kelli! 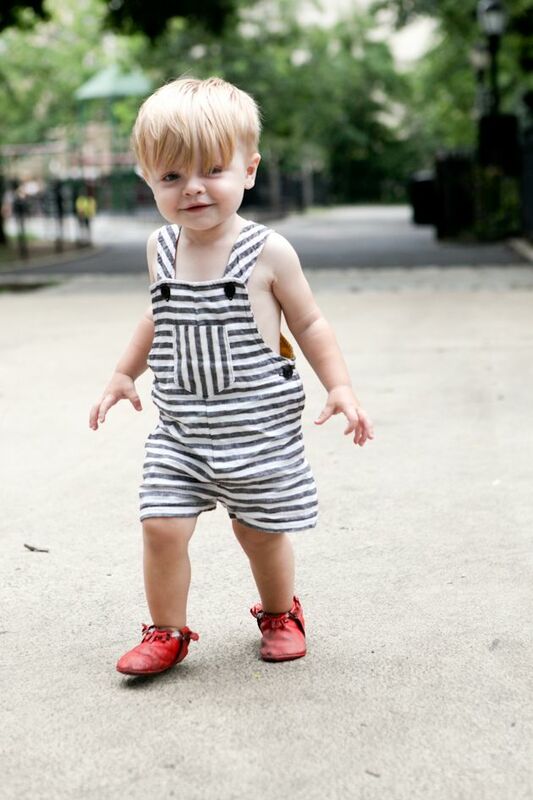 I love overalls on a kid – to me they are the cutest kid-wear. My daughter doesn’t wear them at the moment (too hard to go to the toilet in) but I hope she does again soon! You are right! These are so cool in that modern/ vintage way! So cute!! oh my goodness. That’s the very definition of adorable right there. haha! weird to think about how little he was when you came out. damn ovaries. Your son is adorable and so are the overalls! 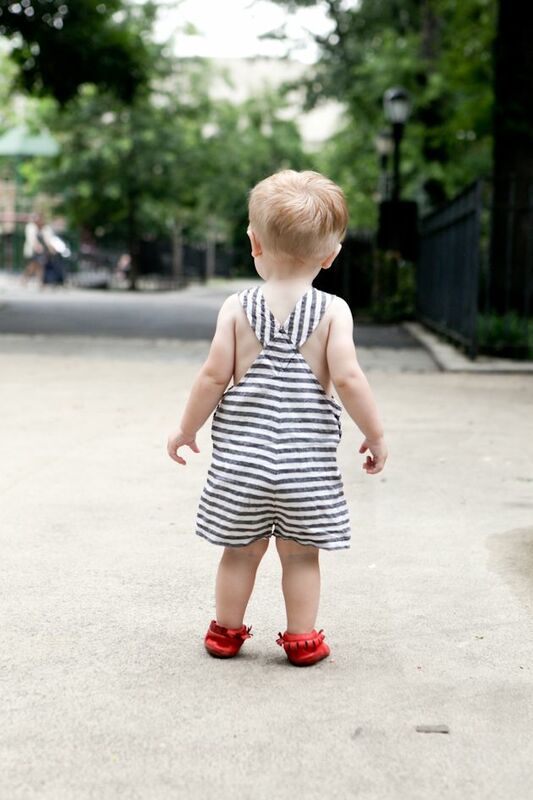 What a great little summer outfit (I’m kinda jealous)! You need to find another pattern in bigger sizes so you can make him more – they are so cute! agreed. i might just need to find another size and then use the exact same fabric because i love it so much. I don’t really sew for my 1 year old boy but this has totally inspired me! so super cute! thank you! the nice thing about sewing for little boys is that they seem less opinionated than my little girl ever was. Oh my gosh, he is adorable! 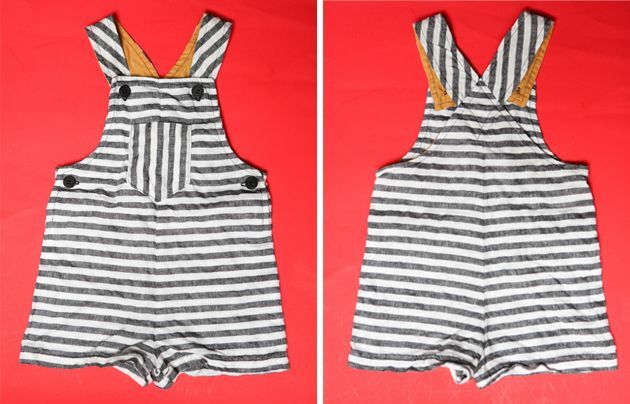 And I love the striped overalls. Cute! thanks. im partial but i think hes pretty cute. He is the cutest and I love these overalls! The fabric is perfect. That’s the one bad thing about vintage patterns–only one size per envelope! Maybe you will stumble upon a larger size one day soon. AHHHHH, SO CUTE!!!!! He is so adorable, and these overalls are just so sweet! as no one else know such distinct approximately my difficulty. Shiver me timbers, them’s some great inntimaorof.